Community Destination Management in Developing Economies is a user-friendly guide that provides a comprehensive view of the issues facing planners, policymakers, and destination managers who attempt to ensure a sustainable future for community destinations in developing economies. Travel and tourism experts from a wide range of disciplines discuss illustrative case studies and effective practical approaches for various facets of destination management. This book explains in detail the complex task of destination management, making the needed basic knowledge and skills understandable to all readers. Community Destination Management in Developing Economies is divided into three sections. The first section provides a basic introduction to community tourism destination management with a special emphasis on community participation and practical case studies. The second section reviews the basic tools essential for managing destinations, such as Environmental Impact Assessments (EIA), Geographic Information Systems (GIS), remote sensing technologies, good governance, and carrying capacity. The final section provides a wide range of illuminating case studies designed to illustrate both the conceptual issues discussed in the first part along with the tools developed in the second part. The book is extensively referenced and has several helpful figures, tables, and photographs to clarify concepts and topics. 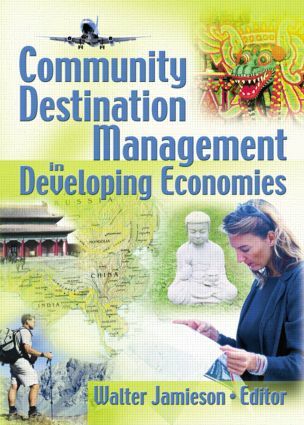 Community Destination Management in Developing Economies is essential reading for urban planners and managers, tourism planners, economic development officials, politicians and policymakers working at the local level, consultants working in developing economies, officials from aid agencies and development banks responsible for developing and approving development projects for tourism purposes, educators and students, and those without tourism planning and development training who need this specialized information.